Minnesotans join with Palestinians worldwide on Land Day | Fight Back! 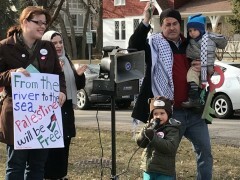 St. Paul, MN - A crowd of 75 people protested at the busy intersection of Summit and Snelling Avenues in Saint Paul on Palestinian Land Day, March 30. The protest was called by the Minnesota Anti-War Committee and Women Against Military Madness to highlight the imprisonment of Ahed Tamimi, among other child prisoners, but news of events in Palestine on the day was on the forefront of everyone’s minds. On Land Day in Gaza, tens of thousands of people began a six-week tent city protest to demand the right of return for all Palestinians. The Israeli military responded with snipers and tear gas canisters dropped by drones. At least 16 people died and more than 1400 people were injured. The Middle East Committee of Women Against Military Madness holds a vigil weekly at Summit and Snelling Avenues in Saint Paul every Friday at 4:30 p.m. to raise awareness about the situation in Palestine and to challenge U.S. support for Israel.